Unique 1-Wire interface requires only one port pin for communication. Each device has a unique 64-bit serial code stored in an onboard ROM. 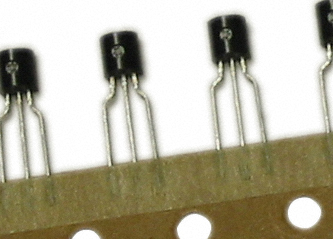 Multidrop capability simplifies distributed temperature sensing applications. Power supply range is 3.0V to 5.5V. Measures temperatures from -55°C to +125°C (-67°F to +257°F). Converts temperature in 750ms (max.). User-definable nonvolatile (NV) alarm settings. Alarm search command identifies and addresses devices whose temperature is outside of programmed limits (temperature alarm condition). The DS18S20 digital thermometer provides 9-bit centigrade temperature measurements and has an alarm function with nonvolatile user-programmable upper and lower trigger points. The DS18S20 communicates over a 1-Wire bus that by definition requires only one data line (and ground) for communication with a central microprocessor. It has an operating temperature range of -55°C to +125°C and is accurate to ±0.5°C over the range of -10°C to +85°C. Each DS18S20 has a unique 64-bit serial code, which allows multiple DS18S20s to function on the same 1-Wire bus; thus, it is simple to use one microprocessor to control many DS18S20s distributed over a large area. Applications that can benefit from this feature include HVAC environmental controls, temperature monitoring systems inside buildings, equipment or machinery, and process monitoring and control systems.